What would you say to the celebrity you admire most? Charlotte’s dream of meeting her Des Bannerman has finally come true. Despite some initial nerves, I must say that I think Charlotte handled herself pretty well when she finally came face to face with Des. While there certainly weren’t any romantic fireworks, Charlotte and Des have several pleasant and funny exchanges that had me smiling. When Charlotte is slapped with a restraining order, I was completely confused. I went over each encounter Charlotte had with Des, and I couldn’t figure out what went wrong. To me, it seemed that Charlotte and Des were the victim of some unusual and unfortunate circumstances that the media blew completely out of proportion. I wondered if Des was really just that mean, or if perhaps somehow Des’ girlfriend was behind the legal action. I eagerly dove into the pages searching for the answer. The first part of the book that covers Charlotte’s adventures in France with her friends is very entertaining and fast paced. However, I must admit that I had a hard time getting in to the middle section of the story. When Charlotte goes back home to New York, she tries to resume her normal life. Unfortunately the fiasco with Des keeps coming up. On top of it all, Charlotte’s boss dumps a ton of work on her, which keeps her working practically nonstop. Despite her intense work schedule, Charlotte and her friends still manage to find time for fun. Their favorite past times seem to be shopping and drinking alcohol. In fact, that seems to be about all Charlotte does in her free time. While I have nothing against a good, strong drink, Charlotte and her friends take it to another level. My head hurt just reading about the amount of alcohol they consumed and then still had to drag themselves out of bed the next morning to go to work. The cycle of working and getting drunk was repetitive and definitely struck me as extraneous. I was left wishing that the focus would return to the problem of the restraining order. Charlotte’s relationship with Liam is interesting and definitely the best thing about the middle part of this tale. Charlotte and Liam have a good chemistry, and I give them bonus points for making a long distance relationship work. Liam is sweet and extremely understanding about Charlotte’s situation with Des. I like the fact that he encourages her to be proactive about the situation so that she can move on with her life. While the physical part of their relationship is definitely a huge part of the story, I like that Ms. Kennedy got Charlotte and Liam out of the bedroom occasionally so they could go on some fun dates where they could really get to know each other. Overall, I liked Charlotte’s Restrained. I found the truth behind the restraining order very surprising, and Charlotte and her friends are certainly a colorful bunch. 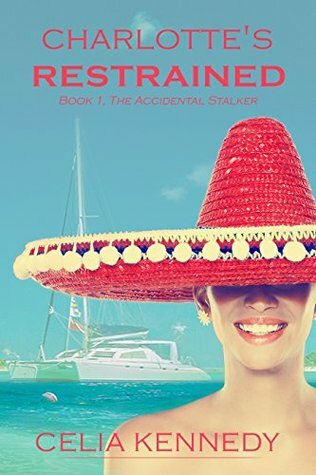 I recommend Charlotte’s Restrained to anyone looking for a fun, contemporary romance.